Sparkle and Shine: Purple Shampoo!?! Purple Shampoo seems to be trending right now in several of the beauty blogs, so I thought I would try it out and see what all the fuss is about. For those of you that do not know what purple shampoo is(which used to be me), basically it is a toning shampoo for light hair. It uses the color wheel logic to counteract brassiness. So if you have gray hair or blonde hair that gets sort of a yellowish tint to either from chlorine or other products you use, this shampoo will take that away. Now I am a blonde and while I do not color my hair, I will use Sun-in from time to time to reinforce the highlights I get naturally in the summer. This means that I have pretty much like a million different colors of blonde in my hair, ranging from platinum to almost brown. I do notice a lot of brassiness in my hair especially when I am at school. I think the water at school might have something in it that boosts the brassiness. Now you can use just a regular clarifying shampoo to strip and product build up off your hair, and if you have darker hair this is a good option for you to get really clean shiny hair that is not weighed down. However since everywhere I looked I was hearing about purple shampoos I thought I would try it out. 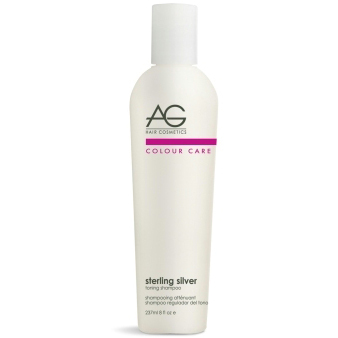 The one that I bought is called Sterling Silver Toning Shampoo by AG Hair Cosmetics. Just as a caution this product is pricey. I bought the little bottle which is 8 ounces and it put me back $14.00 but the regular bottle is 33.8 ounces and $36.00. I did look and you can get is much cheaper on Amazon. There are several different varieties of purple shampoo, don't be scared if it says for gray hair or bleached hair; you can still use this type of shampoo if you have naturally blonde hair like me. What you are looking for in a purple shampoo is a really dark purple color, the darker the better, and for it to say it contains no coloring elements to further make your hair blonder. John Freida also makes a purple shampoo that is much more affordable but it is not as deep purple as the AG one and that is why I chose the one that I did. I was super excited about this shampoo and I was not disappointed. Honestly though at first I was terrified of the dark purple color because I knew that the whole point was to leave some purple to counteract the yellow. I pretty much thought I would come out with lavender hair like Katy Perry, who I love, but I don't want purple hair, I want blonde, that's the whole point. Luckily I do not have Easter egg hair, a plus in my book. It smells great, sorta like coconut, and it lathers very well. It is a little drying which I knew is characteristic of this type of shampoo so I did compensate by leaving my conditioner in longer. I first noticed the effects when I took my hair out of my towel. My hair was in little tiny ringlets and I was horrified. I have curly hair that I straighten everyday and over time is has straightened out a lot. Since this shampoo has some clarifying properties it made my hair curl right back up. Not ideal but that is not the shampoo's fault, I blame it on my mother. After I blow-dried my hair all the curliness went away. My hair was very clean and more shiny than usual. I didn't really notice much difference after the first wash. But after about 3 washes I started to notice some difference in my color. The brassiness was definitely gone and there was a more distinct contrast between my natural highlights and low lights. All in all I am now OBSESSED with this shampoo. I don't use it everyday because it is so expensive, but I have noticed I can maintain it's effects with only using it twice a week.